Featured in CNBC’s January 2018 story How to Stop Your Digital Fortune From Going Up In Smoke by Annie Nova. Listed by Singapore-based Forbes contributor Elaine Ramirez as part of the Have Yourself a Merry Crypto Christmas 2017 gift idea lineup on Forbes.com. Recommended in December 2017 Wall Street Journal article Good News! You Are a Bitcoin Millionaire. Bad News! You Forgot Your Password by Alison Sider and Stephanie Yang. Endorsed in January 2017 Bitcoinmagazine article Review: Cryptosteel Is a Great Way to Back Up Bitcoin Private Keys by Kyle Torpey. Cryptosteel Dash special edition endorsed on the Dash Digital Cash YouTube channel by cryptocurrency maven Amanda in video posted on May 17, 2017. Results of user stress test as seen in YouTube video I just tried to Burn, run over and smash my Cryptosteel, posted by 99Bitcoins on May 26, 2016. I would recommend the Cryptosteel if you have a large cryptocurrency holding as it offers more security compared to writing down your mnemonic sentence on a piece of paper. This product is awesome! It doesn’t require any outside power. It can withstand the elements . You can zap it with a million volts and it will survive. This is amazing. Moreover, I like the idea of an open source hardware project. Best way to stash your passwords or private keys. Love the packaging too. I’m a huge Cryptosteel fan. All bitcoin folk need at least one. Happy birthday to me! Loving both the packaging and the product. 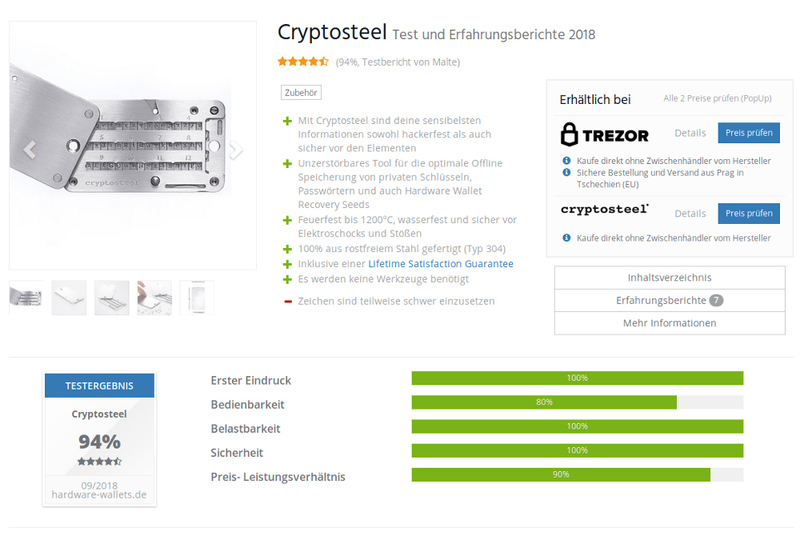 We have been Cryptosteel users for the better part of 2017 and have nothing but the best things to say about it. We literally tell everyone in our network, be it our investors, partners, or clients, that if they are looking to securely store their seed passphrases or other critical data, they need to look no further than a Cryptosteel as it really is the best solution. Cryptosteel is THE most secure way to back up a cryptographic private key or seed. Cryptosteels give you CCSS Level 3 compliance right out of the box, being impervious to fire, flood, static electricity and even EMPs. I truly believe there is no better alternative.